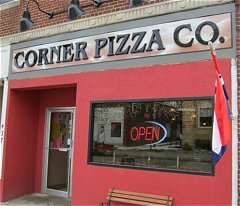 The Corner Bistro & Pizza Co. on 437 West Main Street in Smethport, Pennsylvania offers a wide selection of American and Italian entrees for lunch and dinner. Try the Chicken Parmigiana, Seafood Platter, and Bistro Steak Tenderloin with Shrimp. Other favorites are the New York Style THIN crust pizza, choose from; Four Cheese Pizza, Bianco Pizza, Broccoli Chicken Pizza, Bruschetta Pizza, Buffalo Chicken Wing Pizza, Hawaiian Pizza, Margherita Pizza, Pink Panther Pizza, Reuben Pizza, Total Veggie and BBQ Chicken Pizza. A gluten-free pizza is also available. Artisan pizzas are hand tossed with only the freshest ingredients used in our homemade pasta and sauces. Subs and salads, Stromboli, appetizers, and a delicious selection beverages and craft brews round out their menu. The restaurant is located along scenic Route 6 in the Mansion District of Smethport, Pennsylvania. 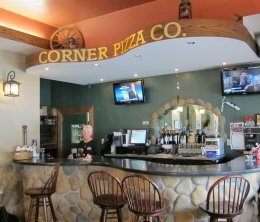 Corner Bistro & Pizza Co.